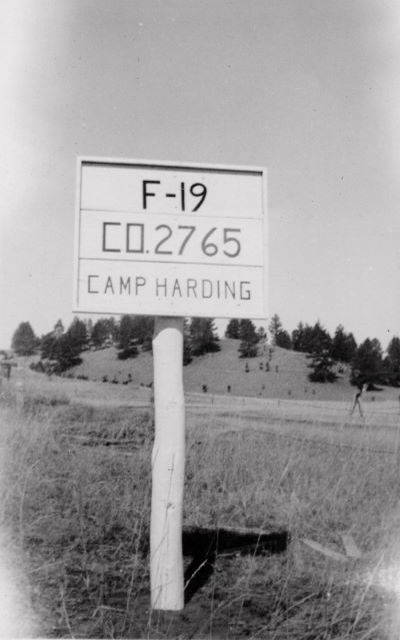 Civilian Conservation Corps (CCC) Camp F-19 was located near the Montana border about 12 miles northwest of Camp Crook, SD, in the area called Long Pines (1935). It may have been in the tip of Custer National Forest that extends into South Dakota from Montana. 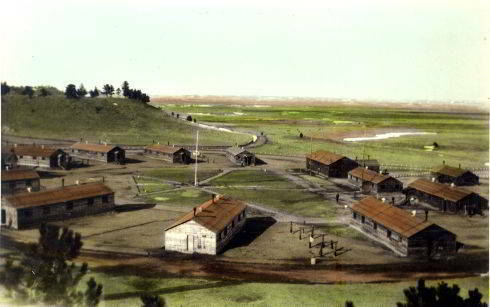 The camp was established July 29, 1934, and closed sometime after the end of 1937. Company 2747--7/29/34-10/24/35; Company 2765--10/29/35-10/14/36; Company 2767--7/16/36-? Company 2747 was organized at Camp Este on July 11, 1934, when the original 18 men were received. A short time later another consignment joined the new company, and contingents continued to arrive until the company finally numbered the full strength of more than 200 men (1935). On the morning of July 29 the company entrained in army trucks and moved to the permanent site. There was nothing in sight of the camp but wide open spaces and a few ridges, plateaus, and eroded hills. "Out among the cactus, rattlesnakes, and grasshoppers," was the way the enrollees spoke of their camp (1935). The first several days were devoted, of course, to completing their camp. Living tents were erected; telephone connections were established; sanitary and other arrangements were quickly completed; and the men adapted themselves to their new environment (1935). On August 1 the company learned their camp was to become a permanent home. In a short time lumber was unloaded and carpenters by the score were engaged. With the assistance of enrollees who were not otherwise engaged, construction work began. The mess hall and shower room were among the first to be completed. There were ample shower accommodations for all, with plenty of "red hot" water and "ice cold" water as well. The mess hall had a seating capacity for all 200 men who would be in the camp during the winter. However, during the summer and fall and until the inception of severe winter weather, many of the men were established in side camps (1935). On October 15, 1934, there were 225 men located at the main camp and four side camps (1935). Company 2765 was a drought relief company organized July 18, 1934, with a 45-man cadre from Company 795 at New England, ND. It was camped on the edge of Williston, ND, until it was transferred on October 31 to Calico Rock, AR. The next spring it moved to a camp on the edge of Wishek, ND, for the summer, before being transferred to South Dakota (1937). The trip was made by a 3-day train ride to Belle Fourche, followed by an 80-mile truck ride to Camp Harding. The company arrived on October 29, 1935. The company was transferred on October 14, 1936 to Camp SCS-6 (Fechner). Though its membership was made up of North Dakotans when it moved to South Dakota, it became a South Dakota company in less than 2 years (1937). Company 2767 was also a drought relief company organized July 15, 1934, at Fort Snelling, MN with enrollees from in and near Jamestown, ND. The company was stationed at Medora, ND, from August 1, 1934, to July 16, 1937. On that date a convoy of 24 trucks from South Dakota transported men and property to Camp F­19 (1937). 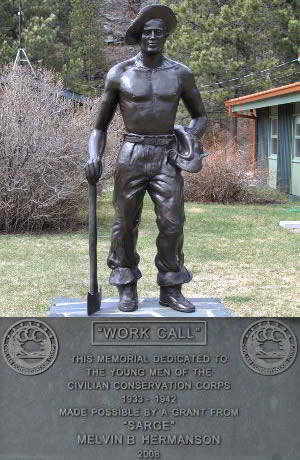 While the camp was being constructed most men were given work assignments under the supervision of the camp superintendent and 11 foresters and engineers (1935). The plan of work included the construction of 16 reservoirs in widely scattered places. Nine were completed in 1934 (1935). Each reservoir had a capacity of around 3,500 yd of water. They were located in the territory of Cave Hill, Long Pines, Slim Buttes, and more immediately adjoining Camp Crook, providing water supply conservation in that sadly water-poor territory. Spring development included the reopening, dredging and tanking of 125 springs (1935). Plans were made to build 75 miles of range fence over a wide area and 42 miles of telephone lines. Much of the telephone line was completed in 1934, connecting the camp with the outside world and establishing telephone communications with many important points (1935). There were 16 miles of roads to be surfaced and 260 miles of forest boundaries to be located and marked 1935). It was estimated that 10,000 dogs should be exterminated; about half of them were killed in 1934 (1935).